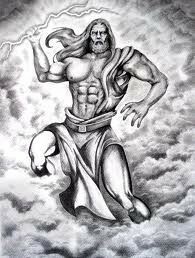 (Zeus roman name is Jupiter)Zeus was once a upon a time the king of the god .He could control the weather and the sky. His most powerful weapon was the lightning bolt. The ancient Greeks believed that when lightning struck earth, it was a sign of Zeus is present. Zeus had more powers than anyone because he was the king of gods. Kronos was the father of Zeus he ate his other children because he was afraid that they we kill him because he killed he’s father. But Zeus was the 8th child and kronos his wife put a stone instead of a baby and hid Zeus in a mountain with a goat that bought him up. When Zeus was older he gave kronos a potion that made him throw up all his sons and daughters. Zeus and his brothers and sister stared a war against kronos and his titans.